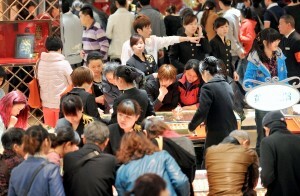 China’s consumer confidence rose in the second quarter of the year, with consumers in first-tier cities displaying the strongest confidence in spending. AC Nielsen said on Tuesday the company’s index for consumer confidence stood at 110 points in the April-June period, up two points from the previous quarter and four points from the same period last year. Yan Xuan, President of Nielsen Greater China, attributed the rise to consumers’ greater willingness to spend and improving personal finances. China’s new leadership has stressed on the need to boost domestic consumption to wean China away from export-and-investment-led economic growth. Meanwhile, on Tuesday Chinese President Xi Jinping said reforms must be comprehensively deepened in order to help China cope with challenges. World stock markets reacted buoyantly to Xinping’s assertions, with markets rising to near five-year highs on Tuesday, boosted by views that China was moving to support its cooling economy. The dollar fell to one-month lows. Nielsen on Tuesday said in its report that consumer confidence declined in 14 of 29 European countries with increasing unemployment, tax hikes and budget cuts. AC Nielsen calculates its quarterly index based on online research among 3,500 shoppers across China. Official data showed that China’s economy expanded 7.5 per cent in the second quarter, a slower pace than the 7.7 per cent growth seen in the first quarter. Consumption contributed to 45.2 per cent of the country’s GDP growth in the first half, which stood at 7.6 per cent.